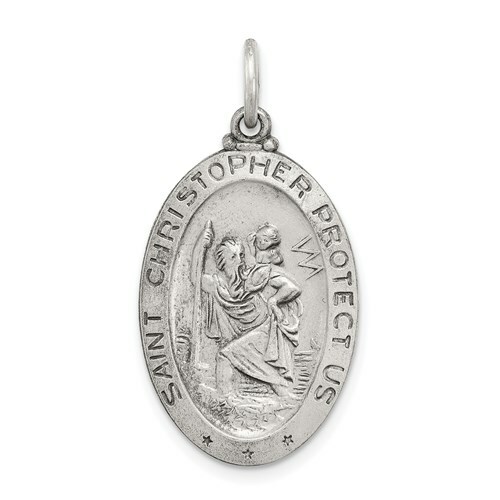 St. Christopher medal for baseball players is made of antiqued sterling silver. Measures 7/8 inch tall by 9/16 inch wide without bail. Weight: 2.47 grams. I am a baseball player and have a special connection with St. Christopher, the patron saint of protected travel. I wear my St. Christopher from Joy Jewelers while playing on the baseball field and traveling during the season. The Joy Jewelers version has a baseball player on the underside, which is very reassuring to me. It is part of my uniform.